This is an interesting video that gives voice to the ongoing de-industrialization of America. I agree with the basic premise of what Adam Cramer saying, namely that there are too few young people today who have either the interest or the aptitute to work "old school", and know the difference between a Phillips and a Standard screwdriver. However, I don't agree that all young people can be written off with this one sweeping comment. At one point in the video Cramer says: "Right now I don't see who the next me is. Where's the next me?" I have news for you, Dude. There is no "next you". You are an original, and that's where it's going to end. This is my son Kevin. 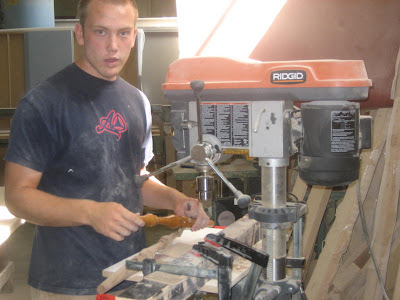 He is now 21 years old, and he's learning the equally challenged trade of fine woodworking and furniture making. He has chosen this path because he loves it and he's good at it, and certainly not because of any encouragement on my part. I am happy to say that this point in his life Kevin is already far more experienced, skilled and talented than I ever was at the same age. On occasion people will say how wonderful it must be to have a son who is "following in my footsteps" so he can "take over" from me. My reply is always something to the effect that this could never happen, nor would I ever want it to happen. I am me, and Kevin is Kevin. There is no way he could ever be the "next me", because Kevin is not me. Nor would I ever want him try. Although he shares my interest in furniture making, I believe that the best thing I can do as a father is to help Kevin find out what best manifests for him. Yes, Kevin may end up using the same shop, tools and machines that I have used over the years, but ultimately what he does and what he accomplishes with them will be up to him. In the meantime I am doing everything I can to help him adapt to an ever shifting market paradigm, in a time when everything seems to be saturated with a glut of cheap crap flooding in from offshore. Cramer is right on the mark when he says that America is de-industrializing. At what point do people realize that an economy cannot function with everyone either unemployed, or working as civil servants and retail clerks at Wally World? Yes, a very intersting video. I have a hard time when someone says 'in my day' because today is very different, on so many levels, then 'in those days'. Many are seeing the importance of being self sufficient. I think things will change (very slowly) she said optimisticly. John, I thought you'd enjoy this video. Today is indeed very different. It would seem that in the video Cramer works alone in his own shop, probably in much the same way as he's done for the past 25 years. His set-up may have worked then, but today is a whole different ballgame if he ever plans to hire any helper i.e. a kid as apprentice. His shop would then become a workplace, and government inspectors would find a enough deficiencies and violations to drive him out of business. In the video alone he's smoking indoors, has improper "no smoking" signage (beside an unsecured electrical wire that would also be deemed hazardous), and is not wearing safety glasses. In addition, the gasoline engine is being operated indoors without proper venting; I see guards missing on machines; and apparent lack of lockout proceedures in use while setting up machines; a serious lack of safety rails around the bikes stored on the mezzanines, not to mention other things. I'm not saying that to be critical, because I admire the guy and what he's doing. But today, any government inspector walking into his shop and assessing it as a potential workplace would likely shut him down. That said, the climate for starting such an enterprise in America - today - is almost non-existent.